We, parents, try our best to accommodate for our children’s needs and make sure they are happy and satisfied with their quality of life. And don’t you feel pure joy when you manage to achieve just that? Most parents couldn’t be happier when they proudly tell their fellow parents how ‘good’ their children are, how obedient, mature, humble and proper. However, have you ever tried imagining how life would look like through the eyes of your children? How would it be like growing up in your household and what emotions and feelings would you have as a child when having to deal with you and your husband/partner? If you could just take a few minutes to try and walk life through your children’s shoes, you would undeniably discover the valuable importance of empathy! Close your eyes and try imagining this; you are a child again, 3 years old , 6, 8 or 10. You are growing up in a house where no one understands you. Your parents expect from you only to be and act happy. In this household, sorrow, sadness and anger are not accepted; they are merely seen as weakness and burdens. Feelings of frustration and disappointment are viewed as failures that shake the family’s fragile foundations. Your parents exhibit feelings of stress every time you are moody or down. They keep telling you that they prefer seeing you always happy and enthusiastic. Whenever you complain about something that bothers you they ‘shut you up’, urging you to look at the positive side of things and not to be critical of anyone. Children look up to their parents for confirmation and guidance on how to behave and feel like. So naturally, you come to believe that your parents are right; that feeling gloomy or sad are traits that define ‘bad’ children. You would, therefore, do your best to live up to their expectations and be perfect like them. But how can you do that? You often find yourself in situations that you never expected you would have to face; that come as lighting bolts to destroy the sensitive, fake and happy showcase you worked so hard to build and sustain. Your little brother breaks mum’s favorite vase and you take the blame for it. Your best friend at school betrayed your friendship and you fell out with her. The boy you are in love with moved out of the city. And there are those usual annual ‘family’ holidays in which you spend most of your time endlessly driving around in the car while your mum enthusiastically rattles on about the beautiful sightseeing. Are you supposed to never feel bothered or angry or fed up about any of these hard realities? If you call your sister ‘stupid’, your mum will probably scorn you by confirming that you can’t have really meant that and you are probably very sorry. When you mention an incident that happened at school your father discourages you by saying: ‘Still, there must be something you also did to get your teacher angry like that’! Your boyfriend broke up with you?….‘Don’t worry you will find someone better, he wasn’t worth it’. Have you failed at the Geography exam after months of hard work and studying? …’Forget it, you will do better next year’. Soon, you learn to keep your mouth shut and just get on with it. Any expression of ‘negative’, to your parents, feelings is totally forbidden and not acknowledged. When you are faced with problems of any kind, you just go to your room and quickly change into your best smile. There is no reason to worry your parents; they hate problems. When asked, during dinner time, how school was today you reply with the usual, accepted ‘OK’ and your parents continue eating, feeling satisfied with your answer. You grow up in a house where everyone is pretending. As years go by, what do you learn in such an environment? No one is really interested in what happens inside your mind and heart. Your emotional and psychological state of being is of no importance. Your anger is just a headache for the whole family. Your sadness strains your parents’ busy day. You are older now and life seems more complicated even. Your love life is in trouble, your grandmother passes away, you need braces; but still you are not expected to have all those negative feelings and trouble your family with them. You become lonely. You learn to avoid situations that will cause you anxiety and distress. You learn to avoid human attachment. You hide your ‘ugly’ emotional world in the video games you spend hours playing, in the pointless flirting at college and the comfort that food gives you so conveniently. You are an adult now, living in denial. You find ways that offer temporary merriment. By now, you know how to sustain this perfect facade and keep everything under control. Open your eyes now. You are the parent. Your children don’t have to grow up in this world. Become a mother that shows real and true empathy towards her child’s life and uses mindfulness in, if not all, most of her actions and behavior. 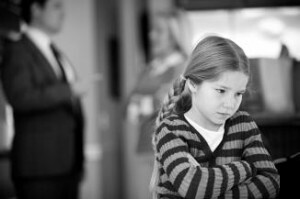 Your children need to know that having negative feelings is normal and that they can challenge those feelings. When challenging negative belief becomes a second nature, children are to be successful at creating optimistic futures for themselves. The target is to raise emotionally intelligent children, not problem free ones.